One of the most exciting and rewarding experiences in buying fine wine is starting to collect a producer’s wine that is in the early stages of a global meteoric rise, that certainly refers to Sandrone’s Barolo Le Vigne. Sandrone’s flagship single vineyard Barolo Cannubi Boschis is already one of the most coveted wines in Piedmont and Antonio Galloni has recently called the 1989 Cannubi Boschis ‘a towering masterpiece’. In Robert Parker’s Christmas issue last year the only bottle he choose to show was a Luciano Sandrone, tasting the 1985 Cannubi Boschis and thereon raving about it. Moreover, James Suckling is in accord, including Sandrone Barolo Le Vigne in his top 100 Italian wines report, while the Wine and Spirit Magazine have awarded Sandrone the prestigious title of 2012 Winery of the year. Sandrone is considered one of the leading lights in the modernist movement of Barolo winemaking. He employs acute green harvests heavily restricting yields, ages his wine shorter than traditionalist dictates and employs extended maceration. However, he also embodies traditional values, perfectly synthesising old and new like Paolo Scavino; straddling the dichotomy of tradition and modernism with supreme precision. One of the tenents of traditional Barolo is that the final blend should come from multiple vineyards, with each vineyard providing something different such as aromatics, rich fruit and structure. It was only in the sixties that Prunotto and Vietti first bottled from single vineyards making this en vogue. Sandrone again comes to the fore here remaining true to tradition and it is within this paradigm that his Le Vigne is now his most sought after wine. It is fascinating that his single vineyard Cannubi Boschis has established his greatness, but that in recent years it his blend of multiple vineyards, Le Vigne, that is now one of the greatest Barolos in the world, scoring 100 points from Galloni in 2010. In recent years Sandrone has been including more grapes from Serralunga, a region known for the oldest most compact soils in the Barolo zone. This infusion gives the Le Vigne a baritone depth, breadth and base, adding its normal essence of bright red fruit, silkiness, aromatics and enveloping richness. We released Le Vigne 2010 at £300 per case of six bottles and it has already jumped above £700. His scores over the last seven yeas have been phenomenal and following on from the perfect score in 2010 global demand is spreading down to the 2008, 2007, 2006 and 2005 and world stock levels are exhausted. As such we are excited to offer a unique yet small parcel of the incredible 2006 and 2008 vintages. These are, along with the 2010 and 2007, the greatest vintages of Le Vigne ever, have the lowest Price Over Points Score and represent, for the time being, exceptional value at £340 and £320 for the 2006 and the 2008 respectively. We are also very pleased to offer these two vintages as they are both entering their drinking windows. Our conclusion is to compare the great winemakers and plots from Barolo to Burgundy. Piedmont was once part of the Savoy kingdom, which also owned Burgundy giving it French winemaking influence. Like Burgundy the wines here are very terroir driven, focused on producers and select vineyard plots, The topography is very varied, with pockets of microclimates. Sandrone produces less than 1,300 cases a year of Le Vigne and 800 cases of Cannubi Boschis, so like top Burgundy plots global demand greatly outstrips supply. We believe that leading Barolo producers will come to benefit from a similar wave of global wine buying which has continued to force the price of leading Burgundy skyward. Sandrone’s two great wines are incredible and already coming under the radar of Asian buyers. If you are currently reading the Japanese Manga ‘The Drops of God’ do not read on as Luciano Sandrone’s Cannubi Boschis 2001 along with Bruno Giacosa’s Barolo Falleto were chosen as the six apostles of wine. 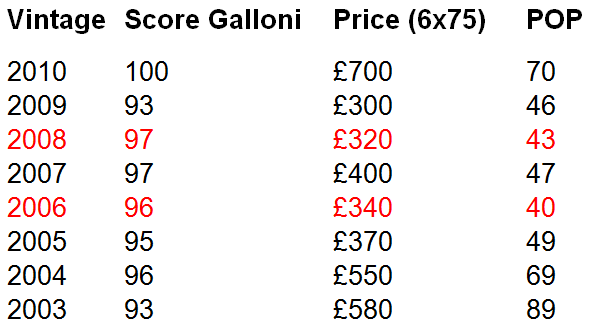 The latter already trades above £1,200 per six bottle case. Therefore, Luciano Sandrone’s Le Vigne comes with our highest recommendation for drinking and investing.